Great thread and work JG. Just enjoyed reading through it all. I've seen that link before; for wishbone removal- and am 'relatively' familiar with the wishbone separation from the hub carrier- (although I've never done it yet- or had detailed info like this from someone who has)- I was thinking more of the separation of the driveshaft from CV joint. Have I misunderstood where this task is going..? so, you are not describing the pinch bolt removal for the dampers here; are you talking about the wishbone removal from the subframe? I 'thought' you were making reference to the joint separation on the driveshaft at the hub. Could I ask you to post a picture of this Jeremy? I'm talking about separating the lower arm from the hub - otherwise known as the steering swivel. I need to do this because the small rubber boots on both steering swivels have disintegrated. 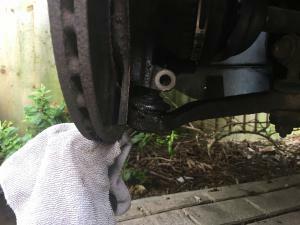 As it happens, I may need to remove the driveshaft from the hub on my Spider as the outer driveshaft boot on that one is leaking grease. 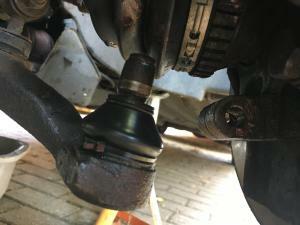 Not sure if I can be bothered doing that myself - as per Ganz's post below, removing the hub nut takes a lot of leverage. Or an airgun. Thanks! Looking forward to getting it back on the road again. It's just taking way longer than I'd hoped! Great job mate. 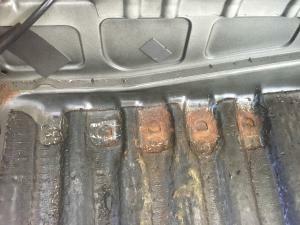 Funny I had the same rust areas though not as extensive. I chipped away the bitumen sound proofing with a big blunt screw driver and a lump hammer. 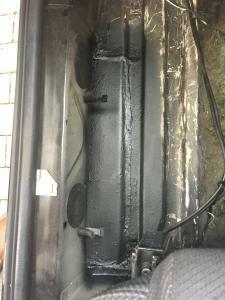 I replaced this bitumen after welding with dynamat matting. The other sound proofing tthat sits on top (the felt) I got rid of as it had cracked like a jigsaw. I replaced it with some floor matting from Woolies in Peterborough (they specialise in interior matting). Keep up the good work. Great to see another 145 being rebuilt. I was reading up on Dynamat a few weeks ago - sounds like good stuff. Was the floor matting rubber-backed felt underlay type stuff? Oh the good old trick of bottom arm pinch bolt removal using a jack on a disc trick. 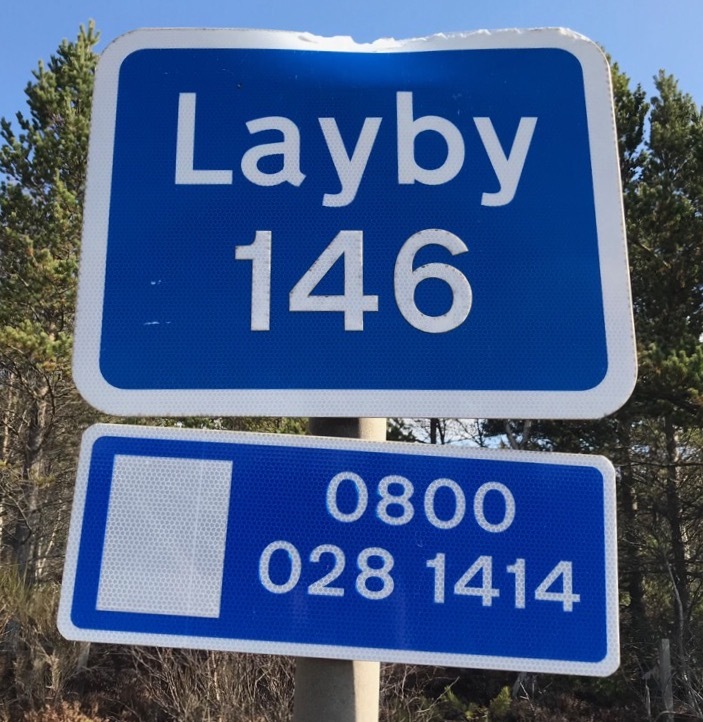 Lay on ones side and *KICK* or a big lump hammer. I miss those days! I love this thread, reminds me of so much. I have a shed load of pictures should anybody need any? The black floor matting from Woolies is a PVC backed felt underlay. Its sound proofing and easy to work with. I left what was the original rubber back stuff mostly the front parts near the bulkhead that seemed solid enough. You're right. It still got the sound proofing. Woolies specialise in interiors so they wouldn't stock something that was pants. As much as I wanted to hang on to the rubberised stuff it was shot to bits. I've just reread this for the third day in a row, and I understand now! So; you are taking the 15mm pinch-bolts from the damper attachment to the hub; am I right..? 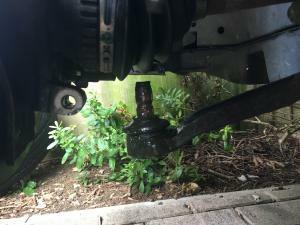 is it not possible to separate the lower ball joint (which i read as 'CV joint') from the hub without undoing it from the damper? (obviously not) but why not..? 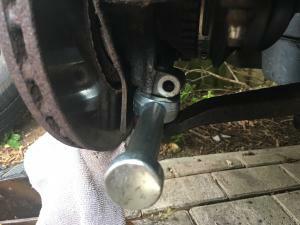 It is possible to separate the lower ball joint from the hub - that’s what I’m currently doing (or will do, now I’ve bought a new joint splitter). No need to undo the pinch bolts holding the damper to the hub - but there is third pinch bolt holding the swivel in the hub. okay- that would be very kind- my head is spinning...! I thought I knew all about what was involved- but I seem to be in a dream world. Let me ask you this- with regard to separating the lower ball joint itself from the hub; is 'one' fighting the rubber bushing between the two (with the joint splitter)? 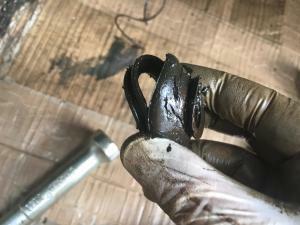 Is it the rubber 'bushing' that holds the two together; or is there a degree of mechanical interference? If the rubber wasn't there (let's say)- would the joint fall out? The rubber dust seal is just that - it protects the joint, keeping the grease in and the elements out. It does not play any part in keeping the joint together - that is done by the retaining bolt.  Do you have a link or some product details you can share for the underlay? Fitted both ball joint dust seals yesterday - and switched around a couple of wheels to tick off another MoT fail - one tyre had been fitted on the wrong side of the car (so incorrect direction of rotation ). So, job done - and ready for welding on Tuesday! ... except... the eagle-eyed amongst you will have spotted that in the photos above, the hub is hanging outboard of its normal position. This is because in separating the steering ball joint, I managed to pull the driveshaft out of the diff. No big drama, as it went back in again, but it involved removing the undertray (or what remains of it) and the wheel arch inspection panel to get a clear sight of the diff casing. 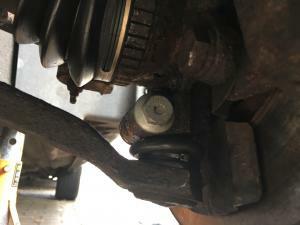 However - on refitting the undertray, and having finished reassembling the suspension, I discovered a spring clip sitting there that looks as though it came from the driveshaft. It was very shiny and clean - so had obviously not been there long at all. I'm not worried about the shaft falling out, as there isn't room for this to happen - but does anyone know if there should be a spring clip on the driveshaft that locates it in the diff? I can't see any mention of this in the manuals. I’ve only just caught up with this thread. 8 years off the road? Do you know why it was taken off in the first place Jeremy? It’s very interesting and inspiring to read what you have achieved. Well done! I didn’t see if and how you sorted out the binding brake. If it’s still not fixed then I would like to suggest that it could be the brake hose causing the binding. If the hose is breaking down internally then all the gunge can act as a block to the fluid. Harpo - top marks and many thanks to you - I've just road tested the car having replaced the brake hose to that caliper, and bingo, the binding is now cured! 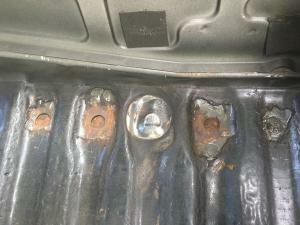 where did you source the replacement pinch bolt and nut for the ball joint pinch bolt..? Has it gone off for welding today? Any idea of a timescale..? Just got the car back from the welders, and I'm well pleased with the results. ... and all for £250 plus VAT. Amazing! Just a couple more things to fettle in the next few days, then it'll be time for the MoT re-test. Was this the stuff you used, Ganz? Oh, sorry- I completely missed that- AND I looked! Terrific result- better than OE! 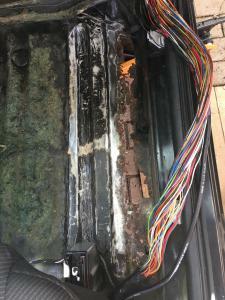 Are you going to underseal the underside now, at those points..? 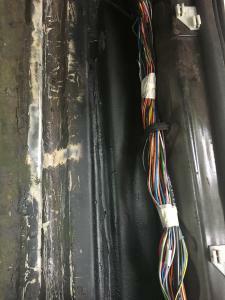 Yes, underseal was applied by the welders. Yes, it could be a keeper! In the meantime, yesterday I got to work on the floorpan. I cut out the newly-arrived felt underlay to fit the front footwells (I even had enough left over to fit some underlay under the rear seat). I also painted over the remaining bare metal in the front footwells with Hammerite. The original underlay mat for the rear footwell is fine and can be re-used. Before I re-fitted it, I chipped away at the bitumen sealant around one of the drain holes, as it had risen slightly. Boy, am I glad I did - as there was rust forming around the hole. I uncovered the others and found the same on 7 of the 10 drain holes. Yikes! So, I wire-brushed them all back to bare metal; treated the remaining rust with Dinitrol RC900; then overpainted with Hammerite. When I can get under the car, I'll also treat them from below. Anyway, having done that, and given I had the front seats out of the car, I thought I'd remove the height adjuster from the driver's seat as per these instructions. 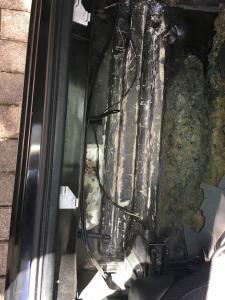 That turned out to be a bit of a mission - as one of the the bolts holding the runners onto the adjuster mechanism had seized and had to be drilled out. And it took a while to figure out how to lever the fabric cover from the seat base. But I've reattached the rails to the now lowered seat and test fitted in the car - it's definitely a better height.